René Amesz……The man behind some of the biggest club tracks over the past 2 years and a string of cool mixes for Fedde Le Grand, Roger Sanchez, Mark Knight, Chris Lake etc. is now back with an undergound bomb to please the floors around the world. 2 versions from the master himself and an amazing remix by Dj Remy & Roland Klinkenberg. Already supported by: Tom Novy, Chris Lake, Sander Kleinenberg, Wally Lopez, Dataworx, Paul Harris, Jim Rivers, Sucker Djs, Micky Slim, Paul Thomas, Richard Dinsdale and many more. This track has been tested all summer long and gained great reactions everywhere. A little deeper than Amesz usual material but might have even bigger effect. It’s a pure crowd pleaser with its hypnotic bleepy theme, simple groove and big builds. No wonder René got tons of request via Myspace after he added the track to his player. This mix is also by the master himself. Build around the same elements but more like the usual Amesz productions. This might be more primetime material – still has the big builds and hypnotic elements. So if you like his usual style better – do not complain – just play this version. No need to introduce these guys…… the team are behind a ton of good releases and mixes. On this one they go a bit deeper than usual and it suits the track perfectly. Floating along nicely with clever delay and reverb effects to make the feel intense on a rather laidback groove. Another awesome production from the succesfull Dutch team. Feeling Rene's mixes. I feel a fool for having overlooked this track a few months ago! I must have been cranky that day or something!!! Great New Amez! Like all mixes! Full Support! Excelent hypnotic track,massive for me. I will play it on Space Closing Ibiza. Great package here, all goood mixes but its the original that does it for me. Great release...love the Original + Remy & Roland mixes!! Original is sleazy which i really like. Remy and Roland mix for the more peak time. Really good stuff as usual the Dj Remy & Roland Klinkenberg Mix is the one that gets my attention. Will definitely be supporting this sat at Ministry of sound. Quality package. another superb cut from rene. orginal mix is a stonker. Good to hear from remy again.gr8 remix. will support all mixes. Really feeling Remy & Roland’s remix! I think remy and klinkenbergremix will do well for me. Good to see Rene back with such a great release! Will be supporting the Original and Dj Remy & Roland Klinkenberg Mix for sure. Really like the Snikkel & Remy v Klinkenberg mixes. Will be playing the Snikkel mix in Russia on Friday. Dj Remy & Roland Klinkenberg Mix & Original are my Favourties! Wow ,big tune!! ..like all mixes + remix. Like this release especially Original and Snikkel mix. I would like to support the DJ Remy & Roland Klinkenberg mix on radio show. All mixes are great but the original really does it for me! Love the Remy & Roland mix, awesome release! The Dj Remy & Roland Klinkenberg Mix is for me!! Wicked release. right up my street, but the original mix is up for me. Awwwww yes, big fan Rene style, like the original mix! Simple hypnotic track but so effective! Love it! Original and remy&klinkengberg are my faves!!!! Very massive stuff mate!!! i like all versions! I like Remy & Roland Klinkenberg Mix i will play for sure! Amesz shows no mercy for the dancefloor.. I want i want this is huge!!! What a great package!! Love the original & the Remy/Klinkenburg mix - wicked!!! But Snickel is the BOMB!!!! Quite liking both the Snikkel & Klinkenberg Mixes. Klinkenberg for some real late night dark room bizness! Love this "new" Amesz kind of sound!!! Can't wait to test it on floor next weekend. Snikkel Mix is my fav! Great tune!!! Feelin all the mixes actually, but its all about the original for me, its got tha funk - bad! Love this! Great new one by Rene! Will play this 4 sure! 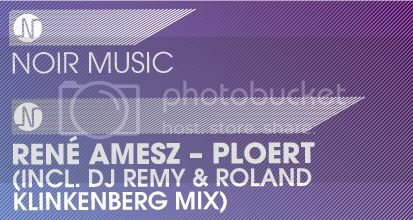 Finally a Rene Amesz full release at one of the hottest labels from this moment, from one of dutch finests dj/producers! My fav is Snikkel's version. Just mental groove! My favourite is the Original. René Amesz strikes back!! I support it in my radio show LA ROCA @ MAXIMAFM and of course, in my gigs. Dj Remy & Roland Klinkenberg Mix is great. One of the best from Noir Music for a while. Full support! Rediculously good stuff from Amesz!!! Amesz Snikkel Mix for me. Dj Remy & Roland Klinkenberg Mix Is the one for me. Hot tune - Love the Snikkel and the DJ Remy & Roland Klinkenberg mixes.